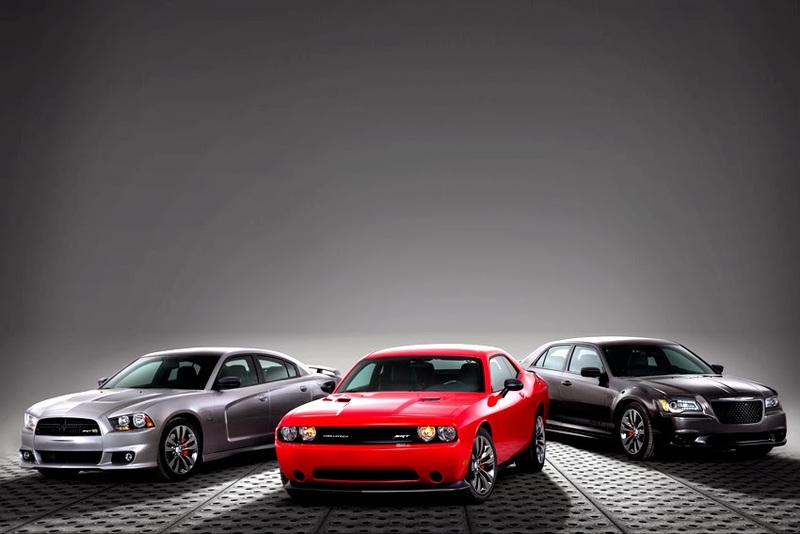 The Chrysler Group LLC's SRT (Street and Racing Technology) brand is expanding its 2014 vehicle lineup by offering new Satin Vapor Editions of its Chrysler 300 SRT, Dodge Challenger SRT and Dodge Charger SRT models. models made their debut at Chicago Auto Show. "We're responding to the diversifying tastes of our performance enthusiast customers by expanding our product lineup to offer more custom models straight from the factory," said Ralph Gilles, President and CEO - SRT Brand and Motorsports, Chrysler Group LLC. "Building on our core vehicle strategy, the Satin Vapor Edition models add some swagger with new, brand-exclusive finishes and content that augment the value proposition of our popular 'Core' price classes." On the exterior, the new Satin Vapor Edition of the 300 SRT offers 20-inch by-9-inch forged-aluminum split five-spoke wheels with a Black Satin Vapor Chrome finish, Satin Black mirrors, Satin Black spoiler, grey 6.4-liter HEMI badge, Satin Black roof and red Brembo calipers. Exterior paint colors include bright white, billet silver and granite crystal. An optional black body stripe also is available. Under the hood of every 300 SRT model is the 6.4-liter HEMI V-8 delivering 470 hp (351 kw) and 470 lb ft (637 nm) of torque. On the highway, up to 23 mpg is achieved by use of an active valve exhaust system that allows the standard Fuel Saver Technology (four-cylinder mode) to engage over a wide rpm range. The active exhaust system also allows for straight-through mid and rear mufflers for a throaty exhaust note under engine load. The MSRP of the 300 SRT Satin Vapor Edition package is US$ 2,300. The Challenger SRT is powered by the proven 392-cubic inch (6.4-liter) HEMI V-8 that delivers 470 hp (351 kw) and 470 lb ft (637 nm) of torque. The torque band is extremely flat allowing for strong standing starts and improved straight-line performance throughout the rpm range. The MSRP of the Challenger SRT Satin Vapor Edition package is US$ 1,700. The Charger SRT Satin Vapor Edition is powered by the same 6.4-liter HEMI V-8 that delivers 470 hp (351 kw) and 470 (637 nm) lb.-ft. of torque. On the highway, up to 23 mpg is achieved by use of an active valve exhaust system that allows the standard Fuel Saver Technology (four-cylinder mode) to engage over a wide rpm range. The active exhaust system also allows for straight-through mid and rear mufflers for a throaty exhaust note under engine load. The MSRP of the Charger SRT Satin Vapor Edition package is US$ 2,330.